The B-611 was first displayed at China's International Aviation and Space Exhibition in 2004, said to have a range of 150 kilometers. The B611 is a two ton missile with a half ton warhead, also reported to have a range of 280 kilometers. China Aerospace Sciences and Technology Corporation (CASIC) displayed a new version of the B-611 short-range ballistic missile, under development since 1995, for the first time in 2006. The solid propellant B-611 seems to have been designed for low-cost tactical army use, with a range limited to 250 km. The missile is carried and launched, in an 8x8 cross country truck. Some trucks are designed to carry two missiles. The B611 basic guidance system will land the warhead within 150 meters of the aiming point. Using GPS for guidance will improve that to less than 30 meters. A previously unknown version of this system was shown at the Zhuhai Air Show in October 2006. This has the designation P-12, and has two missiles mounted on a 6 x 6 wheeled vehicle. The P-12 missiles appear to be similar to the B-611, but with a longer cable strake. The former is also thought to be lighter and probably has a 300 kg HE fragmentation or blast warhead. Following its unveiling as the B611 SRBM at the 2004 Zhuhai Airshow, it was revealed that this new SRBM was actually a co-production program with Turkey, where it is known variously as Project J, J-600T Yildirim (Thunderbolt) or Toros. At IDEX officials revealed that this missile was a program of the Turkish concerns Tubitak and Makina ve Kimya Endustrisis Kurumu (MKEK). Apparently the product of a ten-year program, the missile was first fired to 120km in 2001, and then to 152km in 2003. As a development program the work was finished in 2005, though there initially was no production order for the Turkish military. Yildirim, based on the B611 SRBM, has been customized and produced by Roketsan in cooperation with CPMIEC/SCAIC of China. 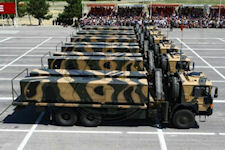 According to the UN Register of Conventional Arms [covering 2006], Turkey had six Yildirim launchers and 97 missiles. Turkey displayed the first of 200 Chinese B611 ballistic missiles that it is building under license during a 30 August 2007 cermonial parade, with three F-600T Missile Launch Trucks and two Transport and Loading Trucks taking part. The Turkish Land Forces’ [TLFC] Yildirim Short-Range Ballistic Missile [SRBM]. The system is mounted on MAN 6x6 cross-country chassis, fitted with a fully enclosed, forward-control cab and an auxiliary power unit. The 600mm solid-propellant [HTPB] missile was said to have a maximum range of 152km and a launch weight of around 2,100kg, including a 450kg warhead. Controlled by four fins located on the tail section, the 6.1 meter long 600mm diameter missile is claimed to have a maximum range of 150km and an accuracy of within 150 meters when fitted with an inertial guidance system, but can also be fitted with GPS/INS guidance. Each F-600T carries one Yildirim SRBM and can be prepared for launch in less than 25 minutes, with the vehicle ready to move again in less than 5 minutes. The missiles can be fired at angles up to 45º. The system is designed for deployment in batteries of six F-600T launchers, with a similar number of transport and loading trucks and a battery command-post vehicle, all mounted on MAN 6x6 vehicles. Meanwhile, China’s CASIC was marketing the missile and apparently planning a 250km range version. It is not known whether the PLA had purchased this missile as well. Chinese reports noted the B611 is intended to compete with the Russian Iskander-E SRBM. CASIC officials noted, like the Iskander, the B611 has a maneuvering capability to defeat missile defenses. Chinese companies promoted weapons to the international market at the 13th annual Defence Services Asia (DSA) exhibition held 16-19 April 2012 in Kuala Lumpur, Malaysia. The China National Precision Machinery Import and Export Corporation (CPMIEC) marketed ithe BP-12A surface-to-surface missile weapon system, which can carry a 480-kg warhead within ranges of 80 km to 280 km, just short of the 300-km range and 500-kg payload export restriction under the Missile Technology Control Regime (MTCR). The BP-12A first appeared at the eighth Zhuhai Airshow in 2010 and is a shortened variant of the B611 short-range ballistic missile. According to the CPMIEC brochure, the BP-12A is “used to attack various important targets with campaign depth, such as missile site, rocket and longer ranger artillery site, communication center, troop concentration site, logistics supply base, and technical support center.” The BP-12A system can carry two missiles-in-container for vertical “hot launch.” The warhead and missile body do not separate during flight. The BP-12A missile system shares the same launching platform as the SY400 multi-launch guided rocket system and the same ground test and launch control system.